How do you see Samsung’s foray into smart learning? Samsung is a leader in technological innovation and we are well-known in the hardware side. 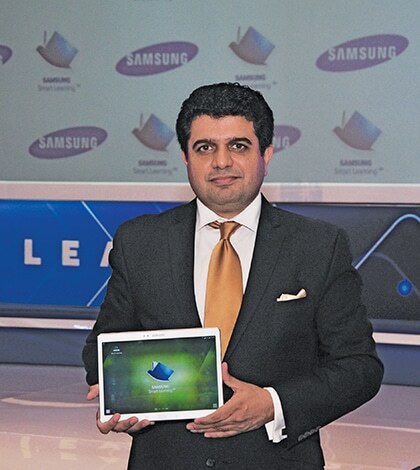 Smart Learning is the first in software services innovation by Samsung. At the end of day, we are looking at converging all the technology devices and continue to innovate. This is the first step in this space. You will see more offerings in the coming weeks. What is the potential for Smart Learning? India is a huge market. The solutions will supplement the educational needs of over 60-70 million students studying in classes 1 to 12 for CBSE board. There is a gap between learning and getting educated. There is a gap in imbibing the pedagogy. We have taken a step forward by working with the best academicians in the country and with feedback from teachers and students. The solutions will be augmented to include other school boards, higher education and skill building content in due course. How long did Samsung work on the education solution? We worked for eight months. How will it transform learning? Samsung Smart Learning provides indepth subject-wise content with elaborate multimedia tutorials, interactive lesson-based exercises and practice tests. The solution is designed to ensure maximum impact-based learning through proven techniques like conceptual videos and collaborative learning methods. What is the response for Smart Learning both from metros and tier II cities? We have got good response from across the country. Actually, the need is the same both in metros and tier II cities. What changes is bandwidth need. Solution and response is the same. It is as low as `2,600 for class X per year for science and mathematics. For class XI onwards, it is in the range of `7,800 to `10,400 for science and mathematics. Students have to buy the entire course which will remain valid for a year. On an average, a student who goes to dinner spends `3,000. This content is licensed. We have to pay license fee to content creators. How do we access the solution? Our target is to reach over 30 million school children. The enterprise team is approaching schools for tie-ups. It is a cloud-based service. It can also be accessed via offline access points. There are approximately 7,000 Samsung stores across. India has been equipped to sell education content on the Samsung Galaxy tab. This will be gradually extended to 10,000 stores. What is the investment in Smart Learning? It is a highly complex investment to be in. We are investing constantly. So is enterprise mobility looking up for education? Enterprise mobility is a big word. As I see it, education and health has to converge on a device. Most of the things will go on a decent screen size of 5 plus on a smart phone. Education, particularly the content, is deep and has to be on TV as well. Will the Smart Learning content come in other languages? We are looking at nine to ten languages in the next few months. Will the software put teachers out of work or supplement their efforts? We are closely working with teachers and spending on teachers’ training in the schools we go. Schools and parents are excited as students are learning and understanding concepts better. This is critical as these are the formative years for students. It makes them skilled for future decisions.